Introducing the Atlantic `115 in collaboration with HeySea yachts USA! 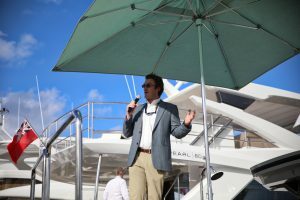 The 2017 Fort Lauderdale International Boat Show is all ahead full. Today we announced a partnership with HeySea Yachts USA to build Project Atlantic 115. In the first place, Fort Lauderdale, Florida is known as the “Yachting Capital of the World”. Here will be the 58th annual 2017 Fort Lauderdale International Boat Show on Nov 1-Nov 5, 2017. Furthermore, here you will find information on this Atlantic 115 in collaboration with HeySea Yachts USA. Additionally, this 2017 Fort Lauderdale International Boat Show will feature a model of the project. Features include a main deck master stateroom or country kitchen. Also, with eight feet of headroom in the main saloon the boat feels huge. With a beefy beam this boat competes with much larger layouts. This project is innovative and revolutionary. So if you are coming by the 2017 Fort Lauderdale International Boat Show be sure to stop by and say hi at our display! Contact your favorite AYS broker for special access! And for more information on the Atlantic 115 in collaboration with HeySea Yachts USA contact Joe Marino or Doug Hoogs today!